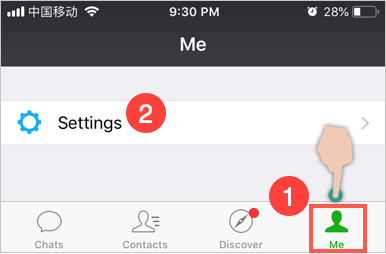 Home » Tech Tips » Apps » How to Send WeChat Message to Multiple People in iPhone? WeChat is one of the popular messaging and payment platform that relies on less marketing. Though the product itself is very easy to use and self-understandable there are many tricks you can do on daily usage. In our earlier articles, we have explained many features like transferring money, sending red packets and topping up mobile. In this article, let us explain a simple yet useful feature on how to send WeChat message to multiple people. 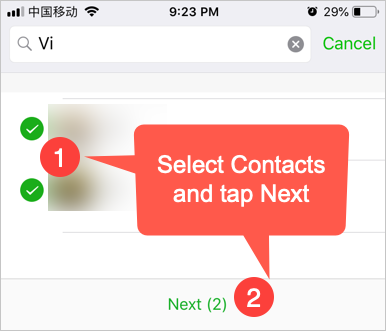 By default, there are no possibilities to send a same message to multiple recipients in WeChat. What you can do is copy and send the message to one by one separately. Otherwise, create a discussion group to chat with multiple people at once. However, WeChat offers some built-in plugin that allows sending message to multiple contacts at once. Broadcasting is a plugin feature in WeChat that allows you to send messages to multiple contacts. This feature is enabled by default in WeChat. Tap on “Me” and navigate to “Settings” option. Tap on “General” and go to “Plug-Ins” section. Here you can see all available plugins for your WeChat account. Tap on “Broadcast Messages” plugin and then touch “Enable” button. 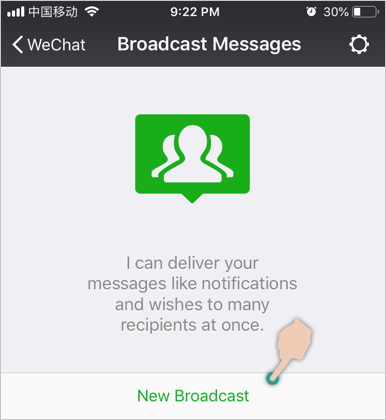 How to Broadcast Messages in WeChat? After you have enabled the “Broadcast Messages” plugin, you will see two options for sending and clearing history. 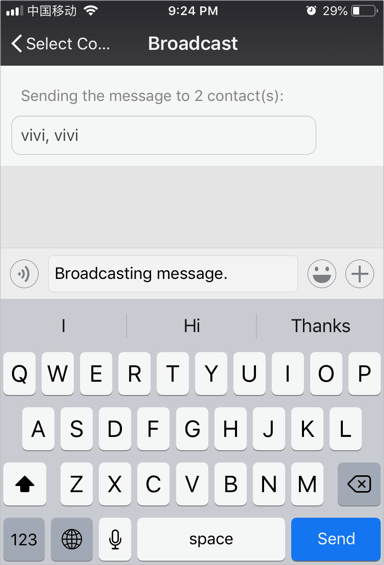 Touch “Send Now” button to start the broadcasting. Tap on “New Broadcast” button at the bottom of the screen to start composing a message. Select the contacts you want to send a message and tap on “Next” button at the bottom. Type your message and send to all the selected contacts. After sending you can go to “Chat” section and view all the sent messages under “Broadcast Messages”. You can check the messages and resend a new message to the same group again if required. 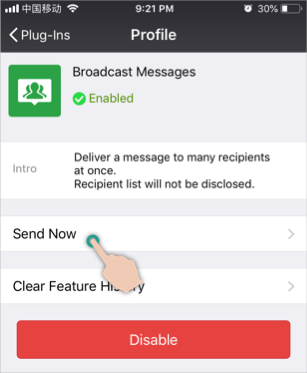 Under “Broadcast Messages” plugin section, tap on “Clear Feature History” to delete all broadcasted messages history from chat section. If you want to disable the feature on your account, simply go to plugin-ins section and tap on “Disable” button. 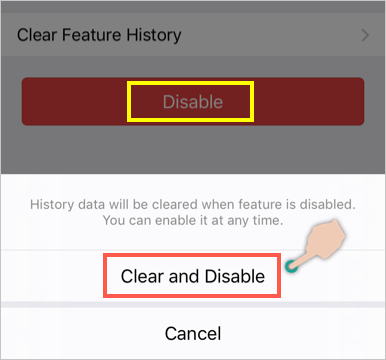 Confirm the action by tapping “Clear and Disable” option. Not that when you disable, all the previously broadcasted messages will be deleted from your iPhone WeChat app. There are no ways you can retrieve those broadcasted messages. The sent messages will be still visible on the recipient’s chat section. You can also only clear the broadcasted history without disabling the feature completely. 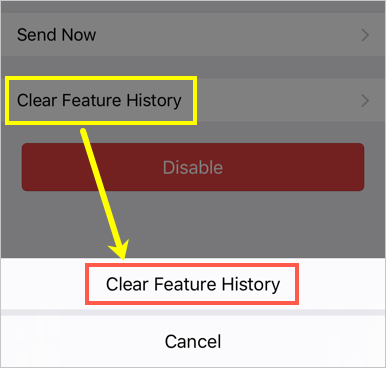 Under broadcast messages section, tap on “Clear Future History” option to delete all the history of sent messages. Though this function is useful it has many limitations in WeChat. You can’t continuously send multiple messages from the same broadcasting screen. You need to send messages one by one by navigating to different screens. You can’t send third party stickers that is possible in normal chat. Also you can’t send external URL links on broadcast messages. WeChat has a character limit of 5000 per message for broadcasting. Each recipient will receive a message as a normal chat message under your name. They will never know that the message broadcasted to multiple other people by you. Unlike regular chat message, there are no ways you can recall broadcasted message. You can only delete on your iPhone WeChat account. You will not see the chat history on individual chat of contacts. Yet, the recipients will see the messages from you as individual chat. WeChat broadcast messages feature is useful in sending same message to bulk people instantly. It works like sending email to many contacts in bcc (blind carbon copy). You can send season greetings to all your friends with a single message. Yet it will be delivered as a personalized message in individual chat of the recipients.